A trip to the library – fun! Do you visit your local library? DD loves to go. 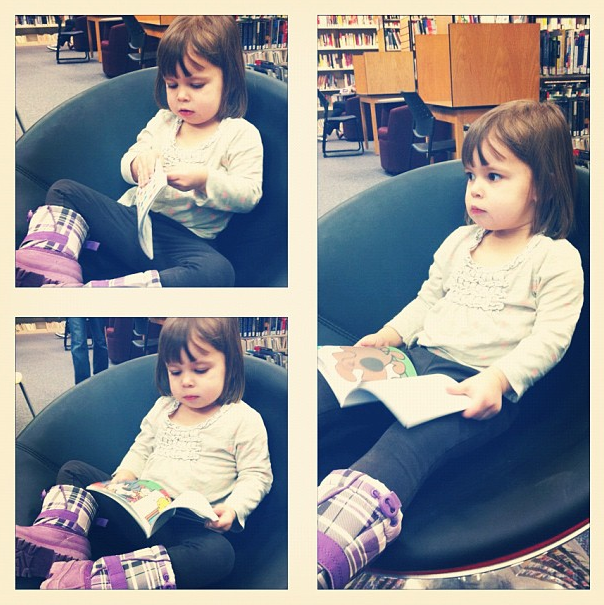 She’ll find a book she wants to read and then move from chair to chair until she finds one just right. A love of reading is a fine thing. It’s Six Word Friday – why not see what others have shared? Thanks Patti, we brought home several books to read together. This is so special ~ I loved the library when I was a kid. My kids were “kids” in France, and we never went to a library together (not sure whether there aren’t any or I just wasn’t aware??!! )…I’ll have to make that a “thing” I do with my grand kids…when the time comes! mmmm……books. mmm….libraries. “Oh the things that you will see” ? Terrific photos to illustrate your post. Libraries are wonderful places. Communications professional. Book nerd. Chocolate enthusiast. Not necessarily in that order. I write about life as I see it.